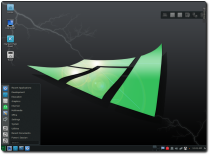 So I downloaded Manjaro KDE edition and installed it onto my Dell Latitude D630 laptop. Upon first boot, everything looks professional and nice. The bootscreen is professional and the desktop has a common theme that is pleasant to look at. Then I went into the menu to see what programs come installed by default. Bleh…everything with a bag of chips, the receipt, and then even more. Too much mess. Multiple entries for single programs. It’s a mess in there. 4 entries for the ‘Marble’ program greet me inside of the ‘Education’ area. FOUR? This is very simple to fix…you simply right click the menu button and choose ‘edit applications’ but how does something like that make it past the QA process? Sound was muted across the board by default….I’m pretty sure this is just due to my sound hardware but it’s important to note that not everyone will know to look for that. Desktop effects enabled by default means that things were DOG slow until I installed a video driver. Not a good first experience. I attempted to download a few torrents out of the gate to see what kind of throughput KTorrent would give me. I use magnet links mostly and upon grabbing my first torrent I realized that nothing was happening. The metadata wasn’t even downloading. So I attempted a restart of the application with no fix. I tried logging out and back on with no fix. Then I tried a restart of the entire PC with no fix. No matter what I did…torrents wouldn’t download. So I switched to qBittorrent. Still no fix. No matter what happens, torrents don’t work for me with this version of Manjaro. In my previous version they worked just fine. About this time, i started to get rather irritated and stopped looking around for things that were wrong. No offense to the Manjaro KDE guys…but this isn’t a very good implementation of KDE in my opinion….there is just too much installed by default and what is installed doesn’t seem to work well. There were quite a few other oddities I experienced while exploring the desktop including multiple KWin crashes when launching specific applications. So I’m heading over to Salix KDE now to see if a simplified approach to KDE will cleans the palate so to speak. I neglected screenshots when testing Manjaro KDE out but I’ll take many with Salix and follow up here.